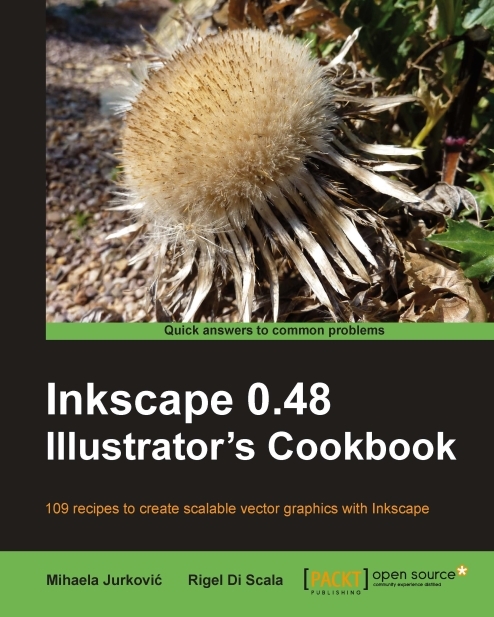 As the title might suggest, this book is a cookbook about Inkscape version 0.48 written for illustrators. This book is published by Packt Publishing and falls in the categories: open-source, graphics, illustration, SVG and is one of Packt’s cookbook series. As a fellow Inkscape-newbie and Scalable Vector Graphics (SVG) enthusiast I will be reviewing this book. Inkscape is an open source vector graphics editor with features comparable to expensive software like Adobe Illustrator, Fireworks and ColorDraw. Inkscape uses the W3C Scalable Vector Graphics file format. SVG can also be used on webpages and is fully incorporated into HTML 5 and is therefore a drawing technology of the near-future. This book is written for people without experience with vector graphics design software and can also be used for people new to vector graphics (while moving away from Photoshop) and people who want to learn Inkscape. This book is also for the intermediate users who want to improve their toolkit and increase their workflow. To use this book you have to have Inkscape 0.48 installed as well as a text editor with programming functions. An installed version of Python is also recommended but not necessary. Windows users could also use PortableApps.com version of Inkscape. Inkscape is an open source vector graphics editor just like Adobe Illustrator and contains features comparable to Adobe Illustrator, Fireworks and ColorDraw. Inkscape uses the W3C Scalable Vector Graphics file format. SVG can also be used on webpages and is fully incorporated into HTML 5 and is therefore a drawing technology of the near-future. As I told you in SVG drawings I started to make SVG drawings in Inkscape. Inkscape is an open source vector graphics editor application, which has capabilities similar to Illustrator, CorelDraw, or Xara X, using the W3C standard Scalable Vector Graphics (SVG) file format. Inkscape supports many advanced SVG features such as markers, clones, alpha blending etc, and enables users to edit nodes, perform complex path operations and trace bitmaps easily. 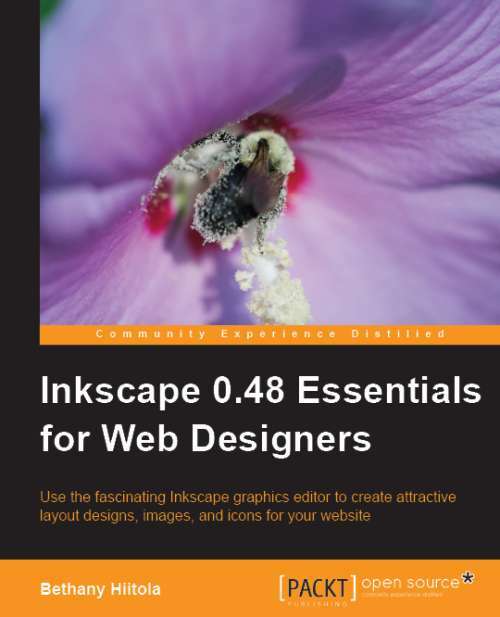 This month I will be reviewing the book Inkscape 0.48 Essentials for Web Designers by Packt Open Source. Packt is pleased to announce Inkscape 0.48 Essentials for Web Designers, a new book that will assist readers to use the fascinating Inkscape graphics editor to create attractive layout designs, images and icons for their website. Written by Bethany Hiitola, this book will teach readers to create their own Inkscape templates in addition to using the built-in ones. Inkscape 0.48 Essentials for Web Designers book starts off with an introduction to the basics of Inkscape and then walks readers through the implementation of each of these features in their websites. Additionally, this book will teach users to create web page and desktop wallpapers with swirling designs, incorporate icons and interactive maps on their website, style and graphically manipulate text, and enhance their web pages using flowcharts, diagrams and site maps. Using this book, web designers will learn to add illustrative and web-ready diagrams, maps and designs to their website, import and manipulate images for their web page, tips and tricks for “tracing” bitmap images to convert them into full vector graphics for both photographs and logos, and to create simple and effective animated GIFs for their web page with GIMP.